One of the advantages of going to our school is the list of activities they arrange each weekday afternoon/evening. These activities encourage students to practice their Spanish whilst enjoying some of the many treats that Granada has to offer. Since we arrived in Granada, Andrew and I have been extremely keen to learn more about the people who have been central to the city’s history and cultural heritage, from Los Reyes Católicos, and the Moors preceding them, up to more contemporary figures such as Manuel de Falla and Federico Garcia Lorca. Today, after school, we had the opportunity to visit the family summer home of Lorca, located in what is now a beautiful park on the edge of the city centre. 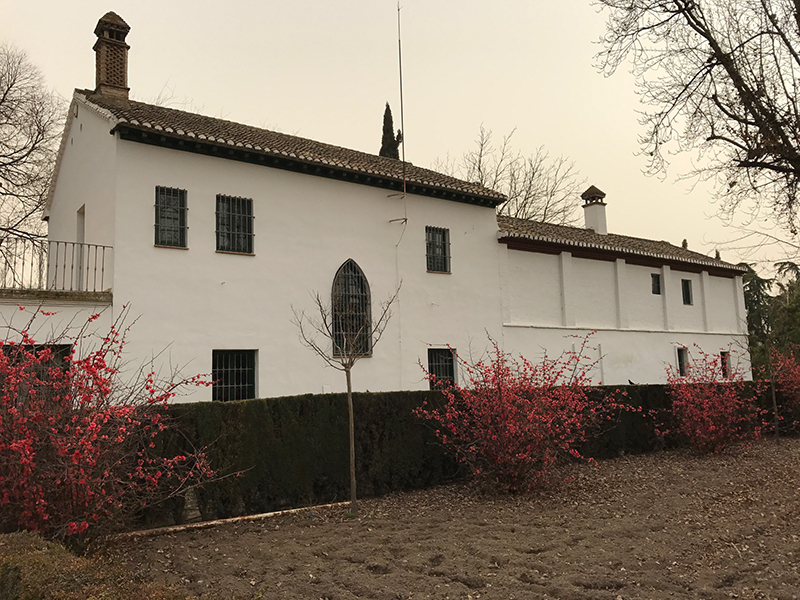 When Lorca and his family lived here, the house was considered to be a country home, sitting in open countryside about 2 kms from the heart of Granada. The family’s winter home was far more central. The house was bought in 1925 by Federico’s father, as a present for Federico’s mother Vicenta Lorca Romero, and the house was accordingly renamed in her honour: Huerta de San Vicente. It is a gracious country home, one half of which was for the family, and the other half housed the staff. 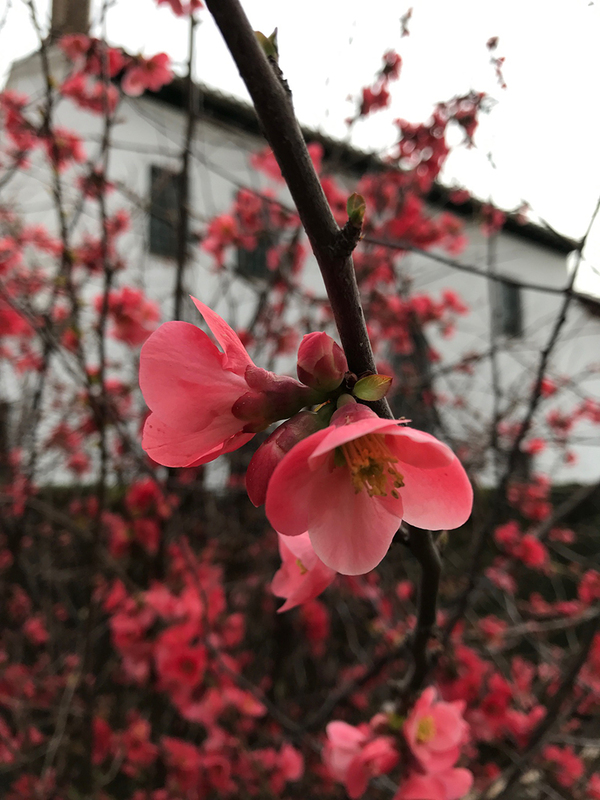 The property today is a reminder of life between 1925 and 1936, the year in which Federico Garcia Lorca was taken to a village to the north of Granada by Nationalist Militia and assassinated. Much of the furniture from the day has been preserved, mainly due to the fact that the staff remained in their half of the house as the Civil War broke out, and kept the main house maintained. Inside, there are rich reminders that this was a family home: the tablecloth in the dining room, hand embroidered by Federico’s mother; the grand piano in the salon, manufactured in Malaga and on which Manuel de Falla performed a piece by Stravinsky; the desk in Federico’s first floor room at which he wrote some of his best known works - Yerma, Mariana Piñeda, Blood Wedding, Doña Rosita the Spinster and The House of Bernarda Alba. Lorca found the peace and quiet at the house, and the views out to the mature trees and the vega, inspirational for his writing. Above his desk, framed, there is the publicity poster of the first play produced by La Barraca, the theatre company with whom Lorca travelled. Walls throughout the ground floor rooms are hung with very personal works of art produced by some of the great names in Spanish 20th Century art, alongside watercolours painted by Federico of backdrops used in puppet shows at the Lorca family home. In the kitchen, the beautiful cast iron stove, a luxury in the mid-1920s, is a subtle reminder that the Lorca family was successful and wealthy, but despite what amounted to the trappings of material wealth, even today this feels like a house with a heart. The photos on the first floor are a stark reminder that the family, clearly so happy here in Granada, had been ripped apart by political activities leading up to and beyond the Civil War. There is one photo that is particularly poignant, taken, if I remember correctly, in 1937, and Lorca’s sister, Concha, is in the background dressed in mourning. Her husband, Manuel Fernández Montesinos was assassinated the day before Federico was killed. It seems inconceivable now, walking around this lovely home in a beautiful park, that the talent of Federico Garcia Lorca was so cruelly and brutally extinguished. It has been argued that Lorca was apolitical, with friends on both the Nationalist and Republican ‘sides’, and it is still not clear whether he was assassinated for his political leanings or his sexuality. However, in August 1936, a friend of Lorca’s informed the militia of the writer’s whereabouts and he was arrested. The next day, he was taken to El Fuente Grande between Viznar and Alfacar, just north of Granada, and along with three other men, he was shot.